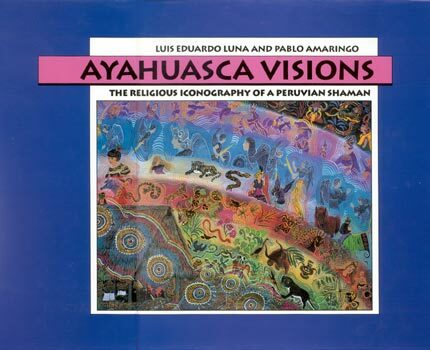 "Publication of these outstanding paintings of ayahuasca visions experienced by a native medicine man, Pablo Amaringo, and interpreted by the distinguished anthropologist, Luis Eduardo Luna, permits us to understand the unworldly psychic effects of the 'vine of the soul.' It is no wonder that this jungle vine plays such a basic role in the medico-religious life of the Indians of the western Amazon." "Pablo Amaringo and Luis Eduardo Luna are to be congratulated for their collaboration. It has yielded a book that is both beautiful and sure to be an enduring contribution to the ethnography and art history of shamanism. The visions and vanishing lifestyles of the ayahuasqueros of Amazonas are presented with wonderful integrity and sensitivity." "During his years of shamanic practice, Amaringo trained himself in the perception and therapeutic application of immaterial influences on human well-being -- which until now have escaped the clutches of western science. I am referring to auras and energies, of both human and spirit origin, as well as their radius of interaction. Even if these insights are mere shadows of what can actually be encountered in ayahuasca visions (as Amaringo himself says), they permit a new access and a deeper penetration into this world than was previously deemed possible. In these times of vast ecological destruction in the Amazon, the most topical achievement of this book in my eyes is, however, the painful reminder that plants in their botnical, pharmaceutical, and spiritual existence may have an immensely more important message for mankind than we ever imagined. The phenomenon of plant-oriented shamanism in Amazonia has not been duly studied and acknwledged. While we have scarcely grasped the pharmacological healing capacity of the tropical forest flora, the ancient knowledge of plant spirituality and of the plants' guiding and instructing powers may vanish with their extinction unrecognized by Western culture." "This is a fascinating and authoritative work about a South American native shaman and his conceptual world. The author, who is a reputed expert both on the psychotropic plants that provoke shamanic ecstatic experiences and on the nature of these experiences -- he has himself taken part in many of them -- has for years lived with these shamans and knows them thoroughly. As a specialist in comparative religion as well, he gives us excellent insights into Indian and Mestizo religious belief systems." "Enchanted castles and pagodas, spaceships with their inhabitants floating above curandero huts, tree-stump spirits and shamanic submarines, giant armadillos and red sorcerors, forest gnomes and monkeys, ospreys and jugglers, radars and floating cities, a black snake with a yellow aura! In the work of Pablo Amaringo, the Amazon -- visible and invisible, prehistoric and futuristic -- comes alive. For the first time in Western book-learning, we see our fantasy of the rain-forest as a Third Eye of the Earth. A humble Peruvian initiate and painter has brought this rainbow vision of the peril, anguish, and healing power yet left in the esoteric botanical kingdom in our late twentieth century. The false glitter of Euro-American technology palls before sheer profundity of the spirtualized jungle." Pablo César Amaringo practiced for many years as a healer in the Peruvian Amazon. Today he paints the visions he remembers from his shamanic practice and teaches young people to paint as director of the USKO-AYAR Amazonian School of Painting in Pucallpa, an art school he co-founded with Luis Eduardo Luna in 1988, where local youth are educated in the care and preservation of the Amazon ecosystem. During the Earth Summit in Rio de Janeiro (June 1992), Pablo Amaringo was elected to the Global 500 Roll of Honor of the United Nations Environmental Program in recognition of outstanding practical achievements in the protection and improvement of the environment through the USKO-AYAR school. Luis Eduardo Luna was born and raised in the Colombian Amazon region. He earned his PhD from the Institute of Comparative Religion of Stockholm University. He is a Guggenheim Fellow and Fellow of the Linnaean Society of London. The author of Vegetalismo: Shamanism among the Mestizo Population of the Peruvian Amazon, he has been since 1979 a Senior Lecturer in Spanish at the Swedish School of Economics in Helsinki and since 1986 an Associate of the Botanical Museum of Harvard University.